High-stakes international litigator and arbitrator with noted successes in state and federal courts and before the Amercian Arbitration Association, the ICDR, and other institutional arbitral bodies. Frequent speaker and author on international law. Currently sits on the Executive Council of the Florida Bar’s International Law Section.Former adjunct professor of law, Nova Southeastern University School of Law; Visiting Lecturer in International and Comparative Law, University of Tartu, Estonia, and Comenius University, Slovakia. Former liaison to Slovakia for American Bar Association Central and Eastern European Law Initiative, providing advice and assistance to various Slovak governmental and judicial organs at independence. Chair, First Annual Florida Bar International Commercial Arbitration Moot Competition (2005). 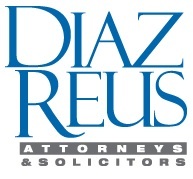 Diaz Reus is an international law firm offering comprehensive legal services to U.S.-based and global clients, including multinational corporations, The Fortune 1000, foreign government entities, public officials, domestic and international banks and other financial institutions, entrepreneurs and high-net-worth individuals. Diaz Reus lawyers have experience in high-stakes international litigation and arbitration involving intellectual property rights, business and contractual disputes, trademark and copyright violations, financial fraud claims, asset-recovery, anti-money-laundering compliance, and criminal and civil RICO cases, as well as in regulatory and white-collar criminal defense. In addition, skilled, multilingual transactional lawyers at Diaz Reus can handle multinational and domestic corporate formation, licensing, tax, mergers and acquisitions, immigration, trust and estate, and family law matters worldwide. From offices in Miami, New York, Caracas, Shanghai, Dubai, Madrid, Frankfurt, Bogotá, Mexico City, Buenos Aires, Panama, Santiago, Lima and Sao Paulo, our multicultural lawyers operate seamlessly in international courts and arbitral tribunals. Diaz Reus international lawyers, solicitors and consultants speak English, Spanish, Catalan, Czech, Mandarin Chinese, Shanghainese, Japanese, Arabic, Hindi, Italian, French, Portuguese, and German.